Vairocana Buddha is a major iconic figure in Mahayana Buddhism, especially in Vajrayana and other esoteric traditions. He has played various roles, but, generally, he is seen as a universal Buddha, a personification of the dharmakaya and the illumination of wisdom. He is one of the Five Dhyani Buddhas. Scholars tell us that Vairocana made his first literary appearance in the Mahayana Brahmajala (Brahma Net) Sutra. The Brahmajala is thought to have been composed in the early 5th century CE, possibly in China. In this text, Vairocana -- in Sanskrit, "one who comes from the sun" -- is sitting on a lion's throne and emanating radiant light as he addresses an assembly of buddhas. Vairocana also makes a significant early appearance in the Avatamsaka (Flower Garland) Sutra. The Avatamsaka is a large text that is thought to be the work of several authors. The earliest section was completed in the 5th century, but other sections of the Avatamsaka possibly were added as late as the 8th century. The Avatamsaka presents all phenomena as perfectly interpenetrating. Vairocana is presented as the ground of being itself and the matrix from which all phenomena emerge. The historical Buddha also is explained as an emanation of Vairocana. Vairocana's nature and role were explained in more detail in the Mahavairocana Tantra, also called the Mahavairocana Sutra. The Mahavairocana, probably composed in the 7th century, is thought to be the earliest comprehensive manual of Buddhist Tantra. In the Mahavairocana, Vairocana is established as the universal Buddha from whom all buddhas emanate. He is hailed as the source of enlightenment who resides free from causes and conditions. As Chinese Buddhism developed, Vairocana became especially important to the T'ien-t'ai and Huyan schools. 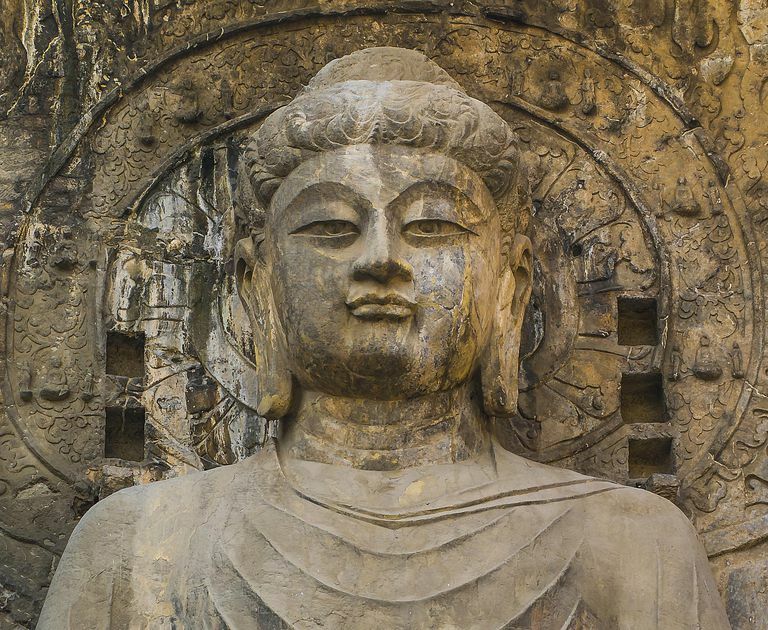 His importance in China is illustrated by the prominence of Vairocana in the Longmen Grottoes, a formation of limestone rock carved into elaborate statues during the Northern Wei and Tang dynasties. The large (17.14 meters) Vairocana is regarded to this day as one of the most beautiful representations of Chinese art. As time went on, Vairocana's importance to Chinese Buddhism was eclipsed by popular devotion to another Dhyani Buddha, Amitabha. However, Vairocana remained prominent in some schools of Chinese Buddhism exported to Japan. The Great Buddha of Nara, dedicated in 752, is a Vairocana Buddha. Kukai (774-835), founder of the esoteric school of Shingon in Japan, taught that Vairocana not only emanated buddhas from his own being; he emanated all of reality from his own being. Kukai taught that this meant nature itself is an expression of Vairocana's teaching in the world. In the Bardo Thodol, the appearance of Vairocana is said to be terrifying to those conditioned by evil karma. He is boundless and all-pervasive; he is the dharmadatu. He is sunyata, beyond dualisms. Sometimes he appears with his consort White Tara in a field of blue, and sometimes he appears in demon form, and those wise enough to recognize the demon as Vairocana are liberated to become sambogakaya buddhas. As a Dhyani or wisdom Buddha, Vairocana is associated with the color white -- all colors of light blended together -- and space, as well as the skandha of form. His symbol is the dharma wheel. He often is depicted with his hands in the dharmachakra mudra. When the Dhyani Buddhas are pictured together in a mandala, Vairocana is in the center. Vairocana also is often depicted larger than other buddhas around him. Beside the Longman Grottoes Vairocana and the Great Buddha of Nara, already mentioned, here are some of the more famous depictions of Vairocana. In 2001, two large standing stone buddhas in Bamiyan, Afghanistan, were destroyed by the Taliban. The larger of the two, nearly 175 feet tall, represented Vairocana, and the smaller one (120 feet) represented Shakyamuni, the historical Buddha. The Spring Temple Buddha of Lushan County, Henan, China, has a total height (including lotus pedestal) of 153 meters (502 feet). Completed in 2002, this standing Vairocana Buddha currently is the tallest statue in the world.